Noreetuh is a modern Hawaiian restaurant in the East Village by Chef Chung Chow. The beverage program features an extensive collection of wines supplemented by simpler selections of sakes and sojus. Noreetuh is open for dinner between Tuesday through Sunday offering elevated Hawaiian cuisine, and offer traditional Hawaiian brunch on Saturday and Sunday. We are happy to host your group dinners, receptions, and special events at noreetuh. While we do not have a private dining room, we offer a semi-private dining area for groups between 16 and 24 guests and privatization of the entire restaurant for groups of any size. Please let us cater your next event! We can create a luau feast or an elegant cocktail reception food! N/R to 8th St/NYU, 6 to Astor Place, L to 1st Ave, or F to 2nd Ave. He celebrated a belated Valentine's Day here. It is one of our favorite restaurants in the city. Amazing food and wine, great vibe. 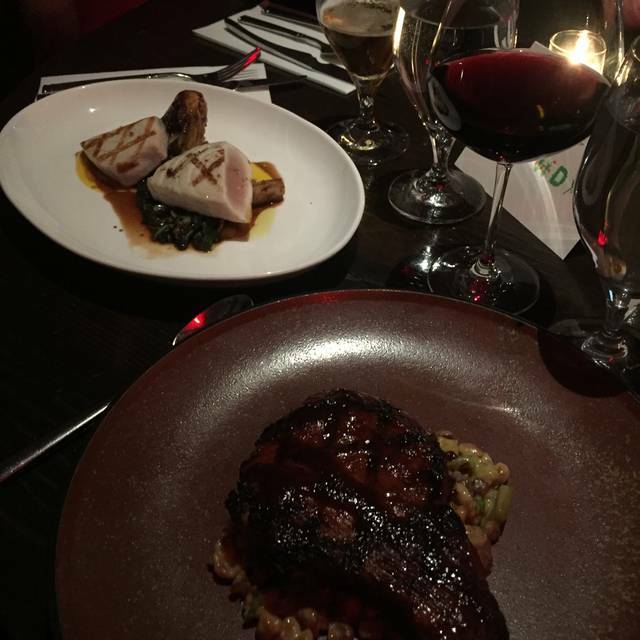 Such an amazing time, we come often and it's always on point- the food, the service. We brought our 3 year old and he was eating up a storm, grabbing the musubi from the share plate, insisting on more steak. The staff let him peek in the kitchen and were so kind. The food was amazing, something for everything, from my vegetarian mom to carnivore brother and 3 year old kid. Great restaurant, unassuming but cozy decor. Very good innovative food. This was my first time having Hawaiian food and it was amazing! I’ve never eaten all of my meals at restaurant before and I did. Everything was delicious and the service was great!!! I love this place!! Very yummy, the uni spaghetti was amazing (I had the waygu, tuna poke, uni bone marrow bread pudding altogether. Everything was delicious, but the spaghetti was the most unique and memorable). I gave the ambiance and price 4s because it was a bit too dark for my taste, and some of the items were definitely pricey. We went out for my date’s birthday and had an amazing time! They had printed the menu’s to say happy birthday and Ben, our waiter, was fantastic. So charismatic, nice and helpful! The food was delicious, we will definitely be back. Really enjoyed our meal. The food was delicious and I'll definitely be coming back. However, it is SOOOO DARK!!! It's unnecessarily dark. Like someone forgot to turn on the lights. I mean sitting in my living room with the TV on is brighter than this restaurant. Great wine list in a casual, approachable setting. Jin Ahn could not have been more friendly & helpful with our wine choices on a busy Saturday night. Fantastic menu and a real foodie spot! Somewhat tight table situation, but that was the only problem. Everything else was great, service and food were absolutely fantastic! The food and service were fantastic, and the ambience was very enjoyable. I highly recommend this restaurant. Noreetuh is one on my favorite restaurants in NYC and my favorite neighborhood restaurant for sure. The food is the perfect balance of inventive fine dining mixed with casual comfort food, and it’s a great place for a date night or friends get together. Excellent service and they take care of you if there are any allergies. My husband and I love coming here alone but we also love bringing people here and they always leave impressed. Terrific food and wine, but best of all is the warm and personal service. We will keep coming back. Really enjoyed our experience at Noreetuh. 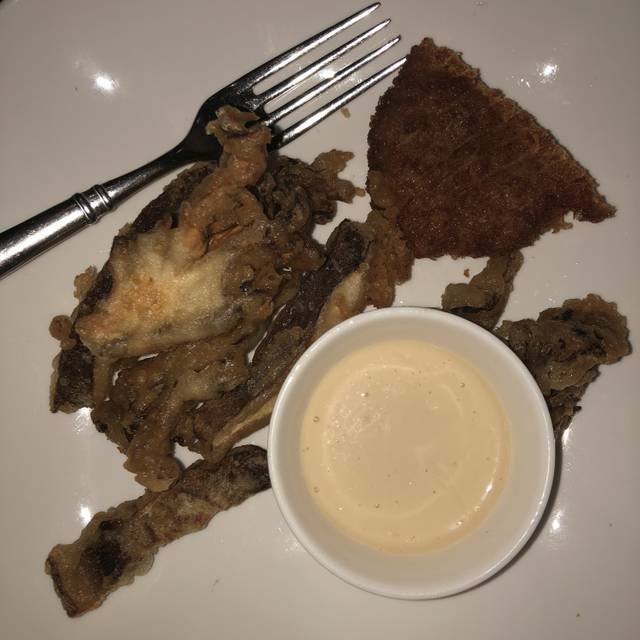 The server was fantastic with my gluten allergy and took pains to make sure my food was safe. She was also super nice and really on point. The food and menu is really unique and interesting. We loved the pork chop - it was the best pork chop we’ve ever had, super moist, and the glaze was the right amount of sweetness. I’d definitely go back. All the food was amazing, highly recommend anything on the menu. The Tuna Poke, Bone Marrow Bread Pudding, Pork Cavatelli, Wagyu Beef were all fantastics. 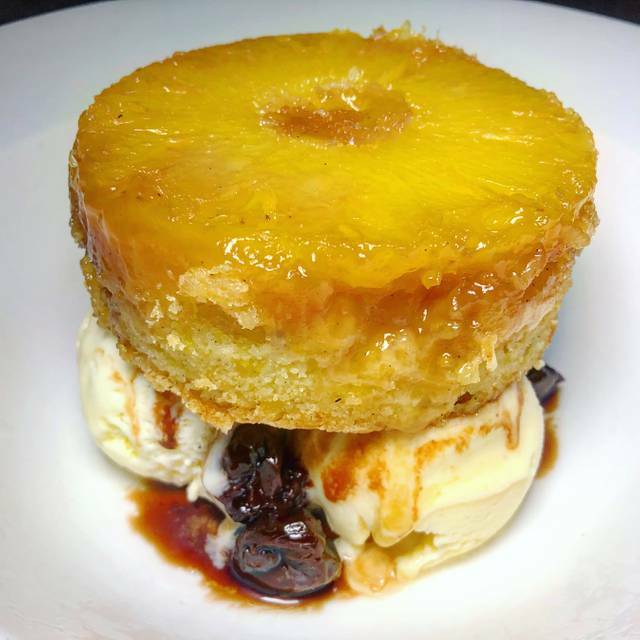 The pineapple upside down cake and the bruléed pineapple did not disappoint. The service was very friendly and helpful with food and drink suggestions. 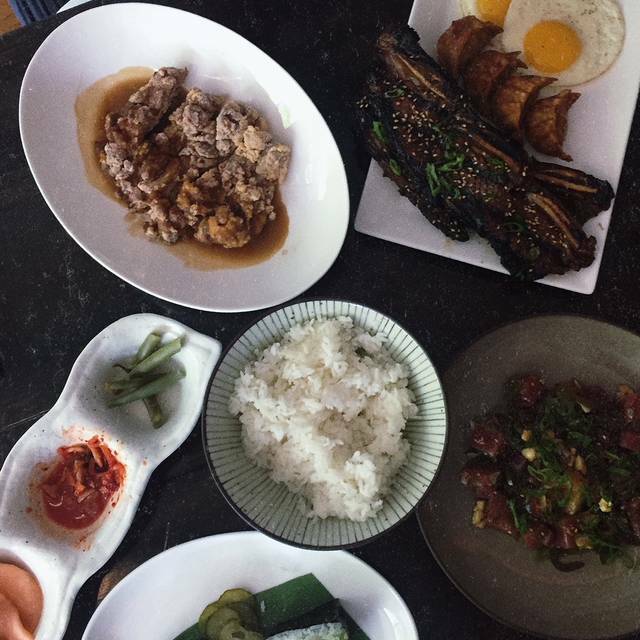 noreetuh has a fun, chill atmosphere, what you would expect from a Hawaiian restaurant! 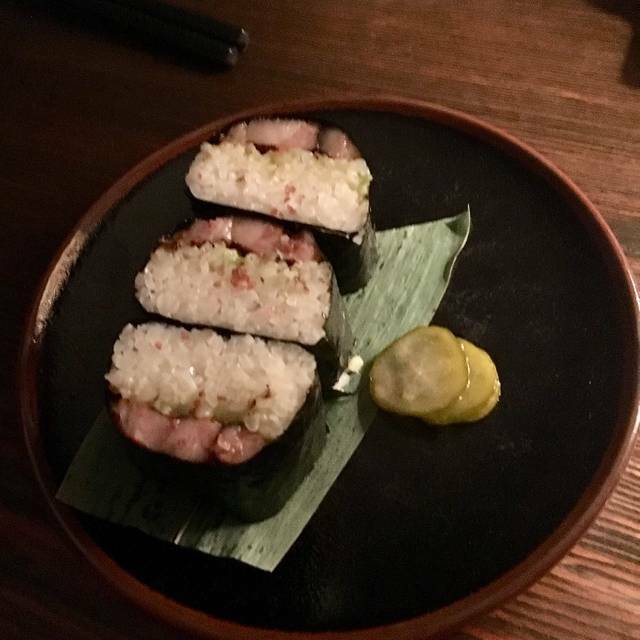 I travel to Hawaii all the time and am constantly looking for good Hawaiian cuisine in New York. I've meant to go to Noreetuh for some time and finally tried it out for a birthday dinner. The food was AMAZING. The poke is true Hawaiian-style poke (not the fake mainland version trending everywhere now), and the dishes were all spot on. Service was impeccable, and the wait staff is very knowledgeable about the menu. Discovered Noreetah during restaurant week. 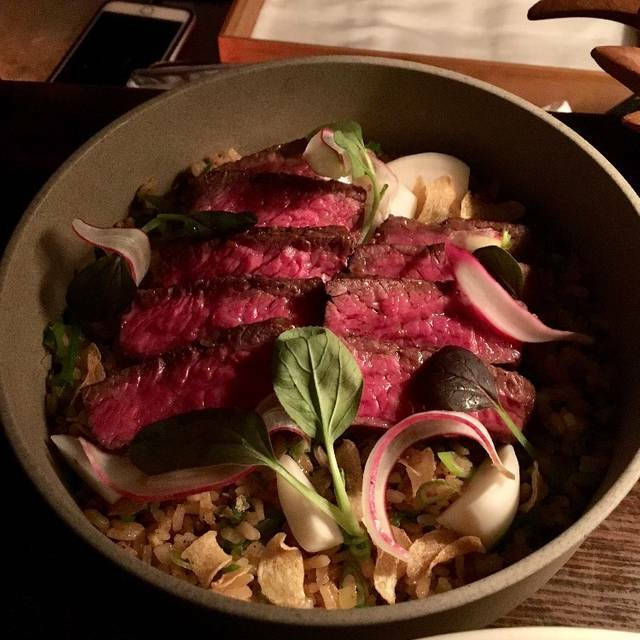 Was one of the best meals we’ve had in nyc. 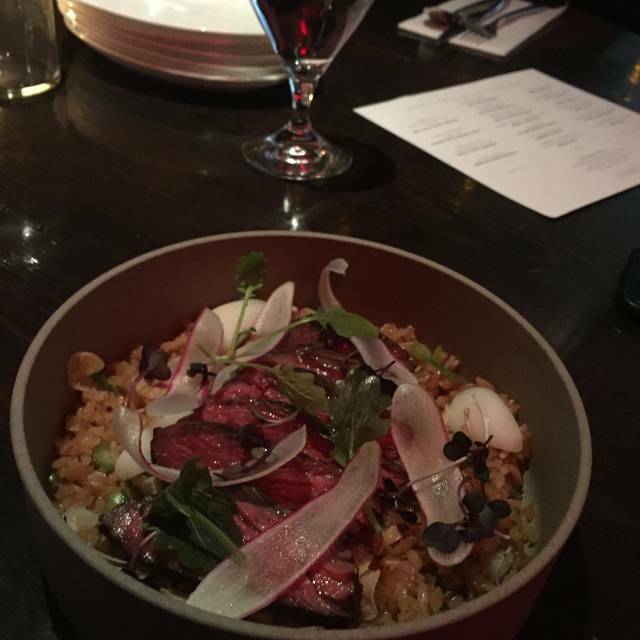 We’d never had Hawaiian before aside from poke, so to experience such great dishes while also getting served wine pairings by the owner himself really boosted our experience here. I treated my friend to a birthday dinner here, but i’d also recommend for any occasion you want to be more intimate and experience good food and good conversation. Went for 2019 winter restaurant week. Came in earlier than the reservation, restaurant was fairly empty at the time since it was only 6:10PM. Got seated immediately. Service was attentive and able to answer our questions. Food was fantastic and well prepared and presented. Hidden Gem in East Village! It's been a while I re-visited Noreetuh. The menu has been revamped so that refreshing and more creative! We had our usual suspect, musubi-series and other starters. They are strong both Meat/poultry menu and seafood menu. The Hokkaido Scallops with Fern menu was so fresh and creative not only by flavor but also the texture! Not only their food is great, the wine selection is outstanding! This time, I discovered their ice cream Sundae and purple sweet potato cake was out of the league! Small, casual but cozy LES "Hawaiian". Very comfortable. Outstanding 3 course Prix-Fixe. mushroom Tempura, Portuguese sausage w black bean puree, potstickers are extraordnary. 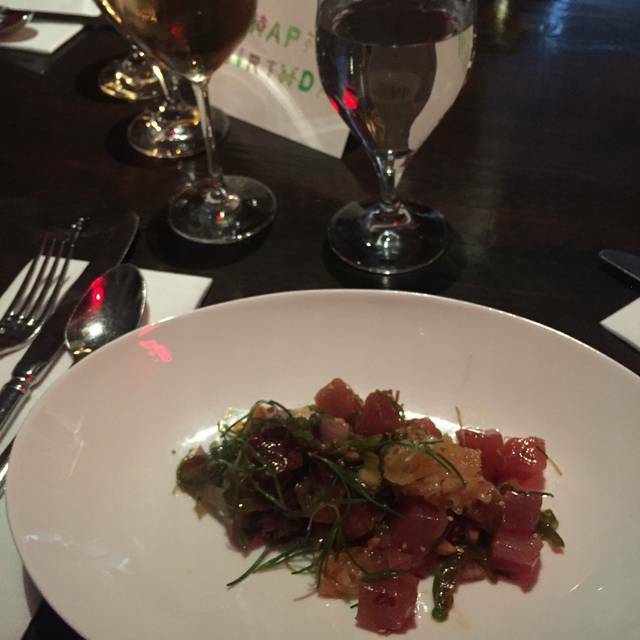 Tuna poke, luau tortellini, trout are very good. Small but well curated wine list, well priced. Service is pleasant and efficient. Pricing is very, very good. Service was amazing, food was very tasteful just as we expected. definitely going back to this restaurant. My fiance and I came here to celebrate one year of being engaged (we got engaged in Hawaii), and Noreetuh was absolutely amazing! We wanted food that was reminiscent of the incredible food we had had in Hawaii, and the dishes here blew us away, from the appetizers to the dessert. The ambiance was intimate and romantic, and the service was great. We will definitely come again. My husband and I had a fabulous experience at Noreetuh. The food was great - very creative and delicious. We went all out getting all truffle everything. Service was outstanding. The restaurant went out of their way to make my husband feel special for his birthday. We would definitely recommend Noreetuh. 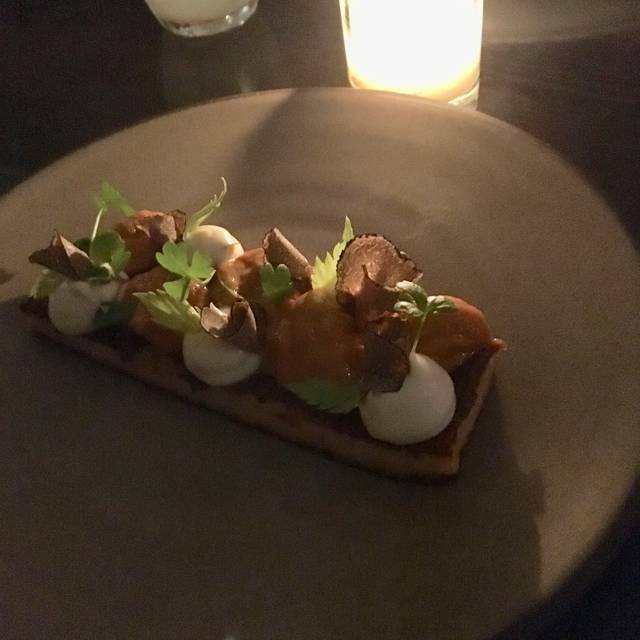 The food is delicious, creative, unique, thoughtful and modern. Great ambiance, excellent service. One of our favorite places to go to, always a great experience. Best poke in the city! Unclear how the made the chicken so well. Love! Delicious, unique and beautiful place! The staff was so professional and well-trained. Small and intimate, very cool. The wine listing was amazing! Great tasting menu and the flavors are unique. I loved the poke because the tuna was fresh. The taro chips with black truffle oil was a great appetizer. I would highly recommend it. The food here was eye opening. Very creative and unique based on Hawaiian/Japanese styles. The wine list is quite unbelievable for a small size cozy place in the East Village. I wan't expecting to see such outstanding wines on their list, and at reasonable prices. I even had a beautiful Hawaiian beer. The food was mouth watering amazing. From scallop sashimi to an upside down pineapple cake paired with a semi sweet white wine, it exceeded our expectations. I've been dreaming of that meal since we left, and will have to go back soon. I think it's more than a meal, it's a kind of special culinary experience that you don't expect when you walk in the door. Always creative food; perfect execution; great value; Hawaiian influences but really the place is an original. Excellent restaurant serving trendy Hawaiian food. Great beer and particularly wind selection including a pairing for $35 that you can get with a $48 pre-fixe (snack, appetizer, and entree ). Basically all the food was delicious with highlights being the truffle oil pasta, pulled pork orecchiete, and fried chicken. The atmosphere was dark intimate and tropical and service was good. Reserve and take some friends or your date! Truthfully, this is one of the great restaurants not only in NYC but in America. The food is spectacular, the wines singular and thoroughly engaging, and the service comparable to the white table cloth joints uptown. Jin is the consummate host and restauranteiur. I absolutely love this place (and believe me I don’t say this about many places at all). Come, eat and come again. I loved, loved my meal. HOWEVER, it was VERY tiny. I mean, I'm a growing girl, and I'm all about moderation - but the portions were too tiny for my taste. My friend and I had the mochiko chicken wings (MEH, good but eh for $9 - my friend really liked it), imperial wagyu ($34), and mentaiko spaghetti with uni ($34). Now, I will forever dream about that pasta, but it was so, so small. The wagyu was delicious, we asked for medium rare and some pieces were definitely very rare - but it had like a small sprinkle of rice on the bottom and it just was not very filling. Food was decent overall but the tempura appetizers and steelhead trout chicharron were very greasy. Service was spotty with appetizers coming out at different times.... we got our salad appetizer after the mains were in the table . We ordered a poke with the mains and it arrived when our mains were finished. At the end of the meal they served a stone cold coffee to my friend. They caught it but I felt the service was bad especially because when we started the meal the restaurant was pretty empty. We also had to remind them to pour our sake which they kept at the bar. I’m not sure I would rush back but it wasn’t bad. I had dinner here with my boyfriend. The food was absolutely delicious, sophisticated and our waiter was very nice and paid attentive service! Highly recommend it.